Address: No.1 Odyssey Dimitriadi str., Batumi, Georgia. Find hotel near Batumi Art And Musical Ce ..
Its placement alongside the seafront is sure to spark creativity of artists and performers! 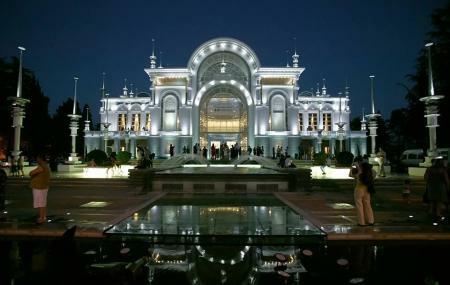 Hosting some of the most remarkable events of home of the city like–the Batumi State Cappella, the Batumi State Symphony Orchestra, Musical Theatre of Youth, Batumi State Musical Center Opera Studio, and quartet “NOTA”, the monument is the architectural brainchild of architect, Vladimer Khmaladze. Accommodating 1100 spectators, on uber comfortable Spanish armchairs at once, the Batumi Art & Musical Centre holds more than 150 annual concerts. A performance here is usually a part of the Black Sea crusies. Given hours are general open hours of the attraction. Timings are subject to events and performances at the location. On foot, by bicycle, or bus. Batumi Art And Musical Centre Address: No.1 Odyssey Dimitriadi str., Batumi, Georgia. How popular is Batumi Art And Musical Centre? People normally club together Batumi Mall and Adjarian Wine House while planning their visit to Batumi Art And Musical Centre. Beautiful Musical center modern design ver clean inside comfortable seat area. Very nice venue for different events! Really love it! Wonderful venue for cultural events. Could do with better air conditioning. Exceptional is all I can say! !